Summer is here! We finally saw some sun! I just felt like the table should be set with yellow for the sunshine. And blue for the blue skies. The sounds of lawnmowers fill the neighborhoods! These are the weekends of relaxing after several hours of playing in the garden. I hope your days are filled with sunshine! The flower pots are clay pots that I used scrap paper and Mod Podge to cover - if you look close in the second to last picture - you will see a spot where I ran out of the yellow paper I was using!! 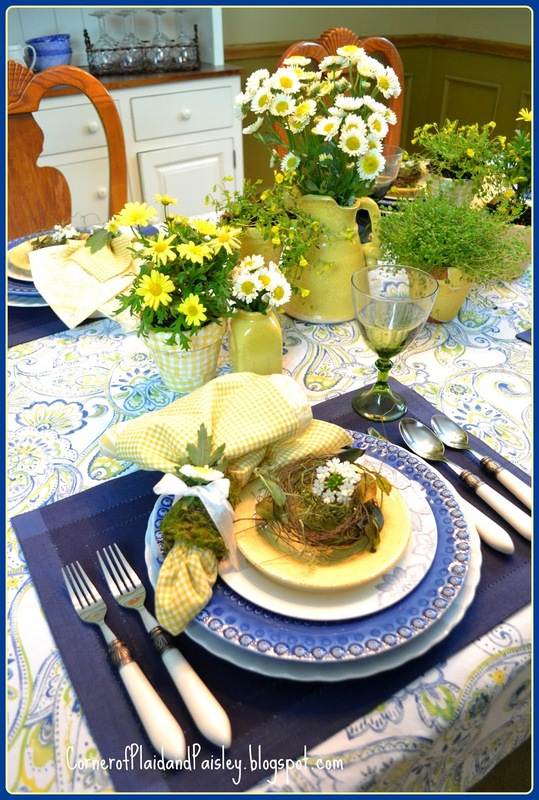 Blue and yellow are always a happy combination. 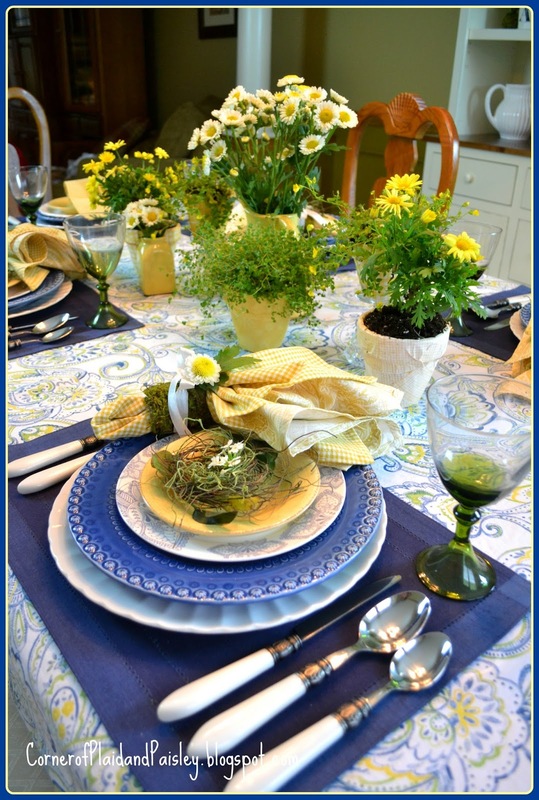 Your table is delightful and the perfect way to usher in summer. Happy Summer to you! What gorgeous colors...and I love your centerpieces...they're beautiful! So pretty. I never thought of papering terracotta pots - what a great idea! Everything is just beautiful! What a lovely table! Love all the flowers and how bright and cheery the table looks! 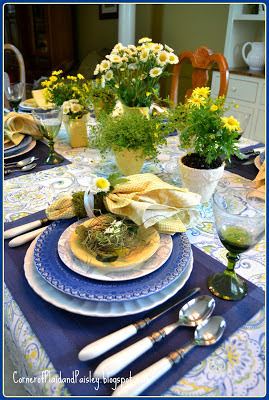 Very cute tablescape! I love green and yellow together. 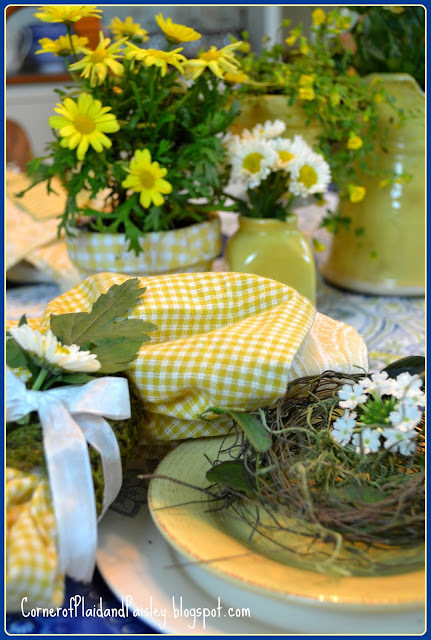 What a sunny yellow and blue table! 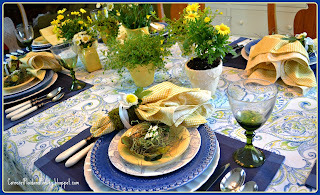 Gorgeous tablecloth and I love the checked napkins tied with a ribbon and embellished with moss and a flower! So darling! I love the summer festive yellow. I would love for you to share this at my weekly linky party. Oh, my goodness I love your table. Yellow and blues are my favorite combo. You blog name is just adorable! New follower! I love the yellow and blue combination and the pitchers of daisies. 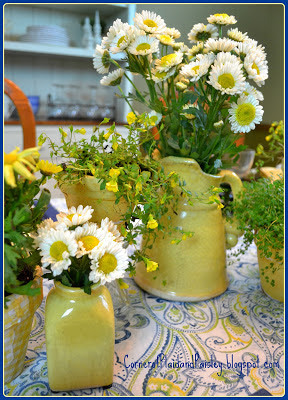 Such a fresh and summery table. 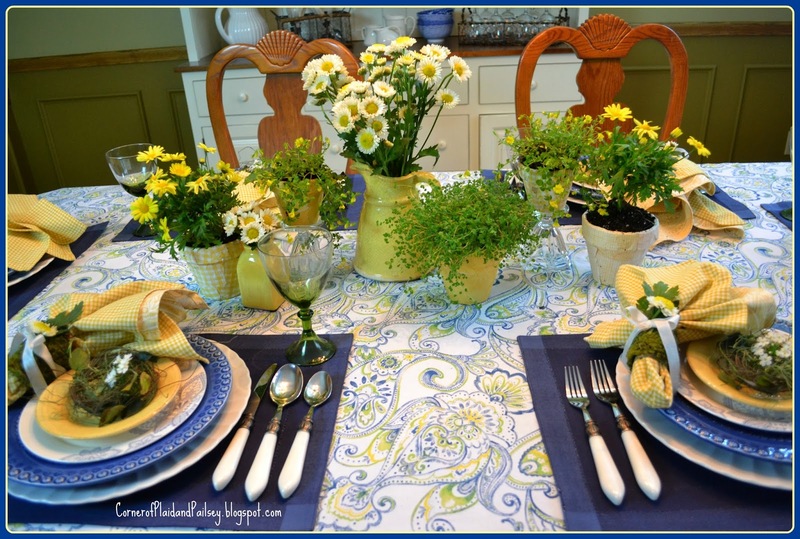 Yellow and blue what a happy table perfect for a sunday brunch.